be stored), you can quickly switch between each storage segment. 2. Master the core technology, SAMSUNG MCU the PID procedures to high-speed 100ms cycle real-time tracking of the temperature of the iron tips, and real-time correction, the magic temperature compensation speed, to make it more stable temperature, the temperature error is smaller and able to adapt to a variety of harsh environment. 6. Use bran-new sturdy mold manufacturing, pressure-resistant anti-fall; blue ferroalloy Iron holder and durable. 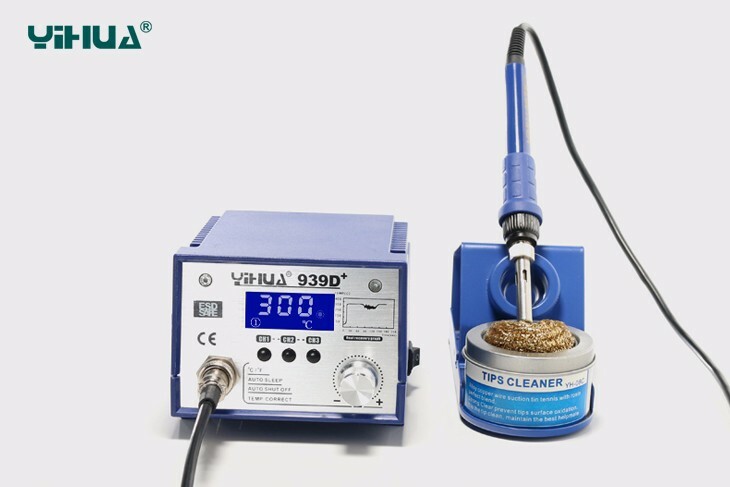 a), Sleep function soldering iron automatic detection of their work status are not in use in a quiescent state, arriving to set the sleep time, the temperature of the iron automatically lower the temperature to 200 ° C enter into sleep state, can effectively prevent the oxidation of iron head and prolong the iron tip service life, energy saving and environmental protection. The sleep time can be set range 0 to 99 minutes in 1 minute steps, users can be set based on usage, if you do not need a soldering iron sleep ,the sleep time is set to 0.
d)-50 °C to +50 °C temperature compensation function. 9.The panel is different from traditional,used aluminum alloy material,with new appearance design and improved performance . 10.The silvery knob give the users high-end and specialty sensor.